Should you play with an arcade stick? If the answer is yes, which should you use? Let’s talk fighting hardware. What controller should you use? Well, budding fighting game player, that’s a doozy of a question. It doesn’t matter what you’re planning to play: Street Fighter, Tekken, Dragon Ball FighterZ, Mortal Kombat, Marvel vs. Capcom, Guilty Gear, Soul Calibur, an arcade classic like Darkstalkers or an arcade less-classic like Jackie Chan Fists of Fury, the control input method question is always a difficult one to answer. The best arcade stick available: what should you buy? Depending on who you ask you’ll get a wide range of different answers. The truth, we think, is actually the simplest: you should use whatever you’re most comfortable with, but you should try every method at least once. This page is here to help you figure out which that might be by talking a little about the value of each control method and showing you some of the best options on the market in each style. Simple! Let’s first tackle the common conception that these games must be played with an arcade stick or bust: That’s false. Don’t just take our word for it: One of the previous EVO World Championship Street Fighter champions uses a PS1 pad in his tournament play. Smug, one of the most incredible players of Street Fighting boxer Dudley ever to walk the earth, also uses a controller – and, really, look at his combos. They’re disgusting. Choice of controller isn’t going to make you great, but picking the right one for you certainly might help. I, for instance, am bloody useless without a stick – and it took me far too long to discover that fact. So, what are your options? 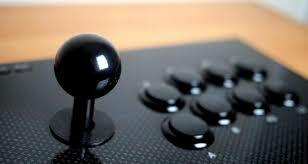 Arcade Sticks – why use one? It took me a while to get to being a stick player, and while I’m alright on controller, I’d now never go back in earnest. Sticks, for my money, are just more comfortable. From my perspective, the main advantage to a stick is in scale – you can spread your hands out a little, and you can lay your fingers across the buttons as if it’s a piano. Where you either have to just use your thumb for inputs or adopt an unconventional ‘claw’ grip on regular controllers, sticks allow access to all six buttons (or more, for some games) with comfort and ease. Some find solace in the size of the buttons, too; they’re springy, they give more feedback, and thus they’re easier to double-tap to hedge your bets on move timing, while the tall, springy arcade stick of course gives a lot more feedback than either a D-Pad or an analog stick. There’s also choice here in a way there isn’t for console controllers: you can have different shape, size and consistency buttons and different shape ‘gates’ inside a stick to determine its movement. For better or worse, the button layout on sticks means if you desperately need to mash it out, that’s easier too. On the flip side, sticks are far more expensive than any other control option and, it should be noted, are generally fairly big – you’ll have to store it or carry it around – keep that in mind. But, if you want a stick, what are the best options? $79.99, available from Amazon or eightarc. The market has changed a lot. With prominent fighting stick maker Mad Catz out of business, one might think it’s Hori or bust – but there are actually some smaller stick makers on the market who deserve your attention. Key among them is Qanba an up-and-coming Chinese company that’s been muscling in on the fightstick market for a few years now. They’re entirely dedicated to fightsticks, which means they know what they’re doing, and their latest range of sticks means business. The Drone is the budget option in that range and is a lovely little stick that clocks in at $80, making it a fair chunk cheaper than many of the other sticks on the market. If you’re looking for a stick that isn’t a budget stick but isn’t mega-expensive either, this is without a doubt the one we’d recommend, without a doubt. It’s lightweight and simple in design, features a pretty slick black-and-yellow themed color scheme and a basic six-button layout. This stick somehow manages to avoid some of the major problems many smaller sticks have – it doesn’t feel cramped to play on, and the quality of the build of the actual stick casing feels particularly solid. These are massive pros, as is the fact that the stick effortlessly switches between PS3, PS4 and PC with the flick of a switch on the stick proper. It’s an officially licensed product from Sony, too (not all sticks are), so you’ve no worries about a PS4 update blocking you our or what have you. The only major downside is that this stick uses ‘stock’ buttons – meaning they’re not from an arcade supply company such as Sanwa, who make the high-quality buttons found in more expensive sticks and actual Japanese arcade cabinets. Qanba’s own buttons aren’t terrible, however, and for this price that should be expected, and buttons can be very easily replaced if you feel like you graduate from the basic ones. The eightarc drone is available from Amazon for $79.99 right now. Qanba is also available on many European Amazon stores, plus from Qanba’s official EightArc store. If you’re struggling for space, the Hori Fighting Stick Mini is for you. This thing is super cheap at just $50 and is incredibly condensed as a result – it’s tiny, and though the Drone is very small for a ‘full size’ stick, the Hori Fighting Stick Mini 4 is nearly half the size of that – impressively tiny. That has pros and cons, since you’ll be cramped while playing, but it’s easier to store. The build quality feels a little cheaper than the Drone and it uses similar own-brand buttons and parts, but this is a great super-cheap beginner stick. Just keep in mind that this feels more like a short-term stop gap than a long-term solution. Razer are of course best-known for their PC hardware, but they’ve recently started to get into fighting games, first sponsoring some pro players and then developing their own line of arcade sticks with those players. The Panthera is their second generation of stick, and after some serious missteps in the first generation this is now a solid, high quality stick – a true contender. Unlike the Hori RAP4 featured below, the Panthera features Premium Sanwa hardware components – the same stuff that’s used in the actual Japanese arcade machines for games like Street Fighter and Tekken. It features some nifty design including a hood-popping topm mechanism to give you quick access for swapping buttons and the like and a generally rock-solid construction. In many ways Razer has stepped up to fill the gap left by the demise of Mad Catz, and the Panthera bears more than a few similarities to Mad Catz’ tournament edition stick line – our previous top pick in this category. Razer has two EVO Champions on the payroll on their eSports side, and it really does show in the quality of their stick – it even has a tournament mode which disables the start, share and PlayStation buttons to avoid any accidental disqualifications. The Obsidan is Qanba’s answer to sticks like Razer’s Panthera, and honestly it’s a pretty close-fought fight between them. 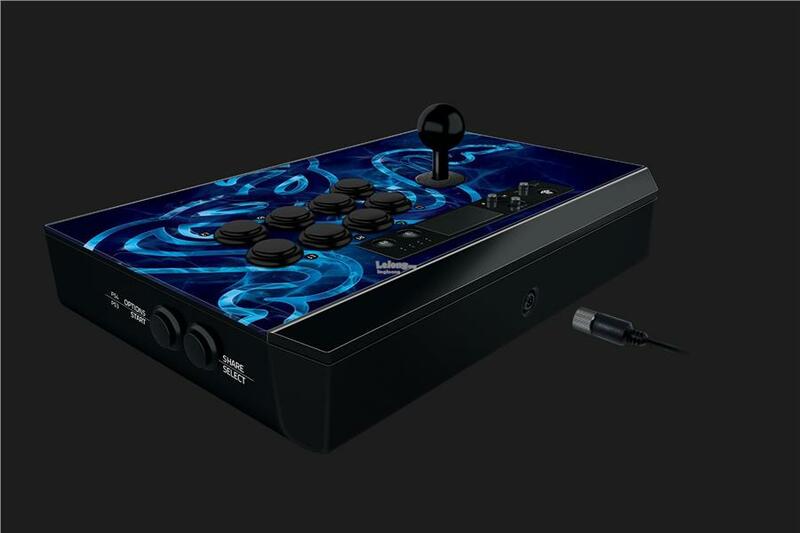 The Obsidian also features PS4, PS3 and PC support, is also an officially licensed product with premium Sanwa buttons and a joystick to match. There’s really not much separating them, and to a point it’s just a matter of taste. The Obsidian features some really slick aluminium alloy bevels and some nice relatively understated lighting when it’s plugged in and in-use. It’s further proof that Qanba is here to stay alongside the big boys. While Mad Catz went out of business over a year ago, you can still find the last remnants of their arcade stick range floating around online – and it’s still the best-in-class in a mid-range price bracket. There are two models, the TES+ and the TE2+ – and both are pretty great, though the latter is a little more expensive. Our pick for the runner-up behind the drone is the Hori Real Aracde Pro 4 Kai – and if you want something from a more ‘known’ named company, the Kai is a safe option indeed. The Kai clocks in a fair chunk of change more expensive than the Drone at $149.99, but it’s without a doubt the cheapest high-quality stick on the market from a larger creator – 50 bucks cheaper than the offerings from Qanba, Mad Catz and Razer. 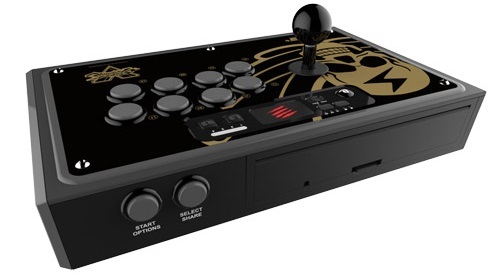 For your extra cash over something like the Drone the main advantage is you get a stick with a much larger spread allowing for more hand room, and you also get Hori-brand Hayabusa buttons. These buttons are arguably not as nice as the Sanwa buttons found in truly high-end sticks, but they are a step up from those in the drone and are quite a bit quieter as a result. It also comes in a variety of colors. We don’t have an enormous amount of hands-on experience with the new PS4 model of the Kai, but the stick shape and design is similar to popular Hori efforts from last generation which I used extensively and found to be decent for the price. If you want a stick that’s ‘middle of the road’, this is the one.